I picked a book on Myanmar (Burma) for which there were a lot of references in the previous books we read which took place during the 2nd WW Japanese occupation. I thought this book will be a good transition to delve into the history and diverse culture of Myanmar, not to mention that I have recently visited the country. Please include the activity on your calendar so you won't forget the date/time/place and cancel if you cannot make it. Charmaine Craig’s novel is a fictionalized account of her mother’s extraordinary life, from growing up in Burma during the Japanese occupation to winning the national beauty pageant and becoming an army commander’s wife. CAN THERE BE ethnic identity without tribalism? Does loyalty to our group honor the sacrifices of our ancestors, or does it prevent us from seeing ourselves as part of the human family? 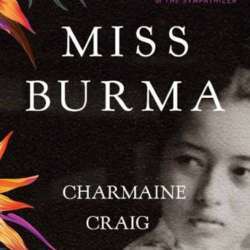 This is the topic of a heated conversation some hundred pages into Charmaine Craig’s epic novel Miss Burma, between two characters whose groups have historically been oppressed: Benny, a Burmese-born Jew, and Saw Lay, a member of the country’s Karen ethnic minority group. “Surely you know ‘unity’ is just the word tyrants use before heads begin to roll,” Saw Lay cautions Benny, who is more optimistic about Burma’s prospects as a multi ethnic nation. Please see the links on the book. Charmaine Craig studied literature at Harvard College, received her MFA from the University of California at Irvine, and serves as a faculty member in the Department of Creative Writing at UC Riverside, where she particularly enjoys teaching literature, the art of the paragraph, and forms of narration. Her first novel, The Good Men (Riverhead), was a national bestseller translated into six languages. Her second novel, Miss Burma (Grove), long-listed for the Protected content Book Award for Fiction, is based on the lives of her mother and grandparents, all born in Burma. Formerly an actor in film and television, she grew up in Los Angeles, where she now resides with her husband, author Andrew Winer, and their daughters.